A homemade version that is 100% natural and made with good-for-you ingredients. A version that is high in fiber and free of refined sugar, that actually tastes good great amazing. A homemade version that tastes like the real deal! To be honest, all I can think about is this dreamy chocolatey spread... probably because I'm so shocked at how good it turned out (unlike my failed attempt a couple months ago, which was gritty, bitter and turned rock hard in the fridge). 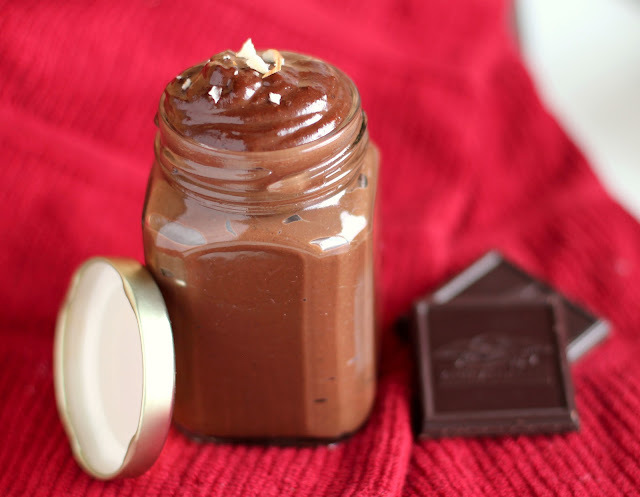 But don't worry, I'm not obsessed with this DIY Nutella. I'm not. Okay I definitely am. I ate this off the whisk, I ate this off multiple spoons a spoon, I even ate it off a knife... definitely not the safest thing to do, it was just that good. I couldn't help it, I couldn't stop! It's just so sweet and creamy and smooth and chocolatey. It satisfies the chocolate monster inside you. I'm starting to think I don't have a chocolate monster inside me at all, I'm just the chocolate monster itself. 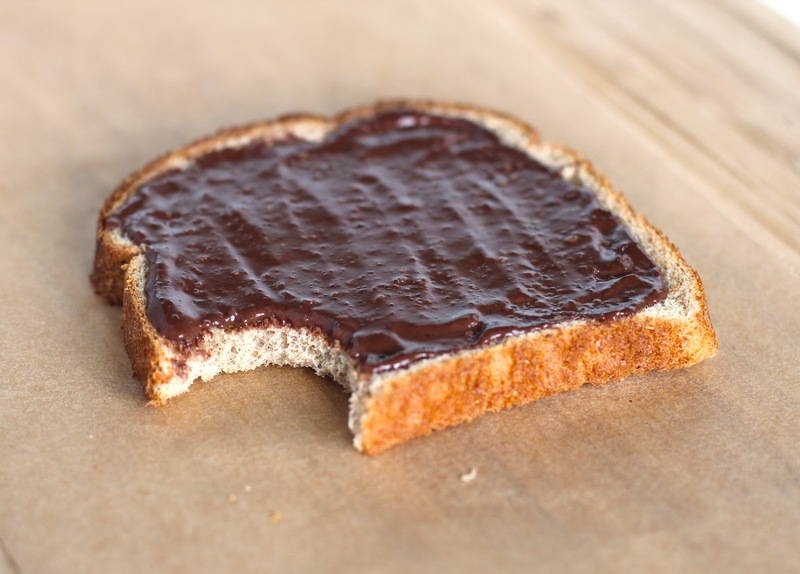 For the safer chocolate monsters out there, spread this "Nutella" on whole grain bread ... with a butter knife ;) You can also use it as a dip for apples, bananas and other fruits. That or a spoon. Whatever suits you more. 3) For a more authentic milk chocolate taste you can try using fat free evaporated milk (not condensed milk!) instead of the almond milk. I'm allergic to dairy so I had to use almond, which still tasted great! 4) I was going to measure how much this recipe made (it makes a lot! ), but I um, accidentally taste-tested a few too many spoonfuls before I thought to bring out a measuring cup -- *whistles and looks away* -- all I know is that this is definitely lower in calories, fat and sugar than storebought Nutella! 1. In a medium-sized mixing bowl, whisk together the hazelnut butter and oil. Whisk in 20g (1/4 cup) of the cocoa powder and the extract(s). 2. Whisk in the almond milk (I did this 3 tbs at a time, whisking between each addition). 3. Whisk in 20g (1/4 cup) of the cocoa powder, then 60g (1/2 cup) of the erythritol. Whisk in the last 20g (1/4 cup) of the cocoa powder, then 30g (1/4 cup) of the erythritol. 4. Whisk vigorously to get rid of any clumps and give it a taste (it should be creamy and sweet as of now. You can add ~1/16 tsp of salt if you like, more stevia and possibly some more cocoa). Serve immediately or store in a pretty, sealable jar in the fridge. Stir before using. Life is complete with a jar (or three) of these in the fridge. I love you for posting this!! 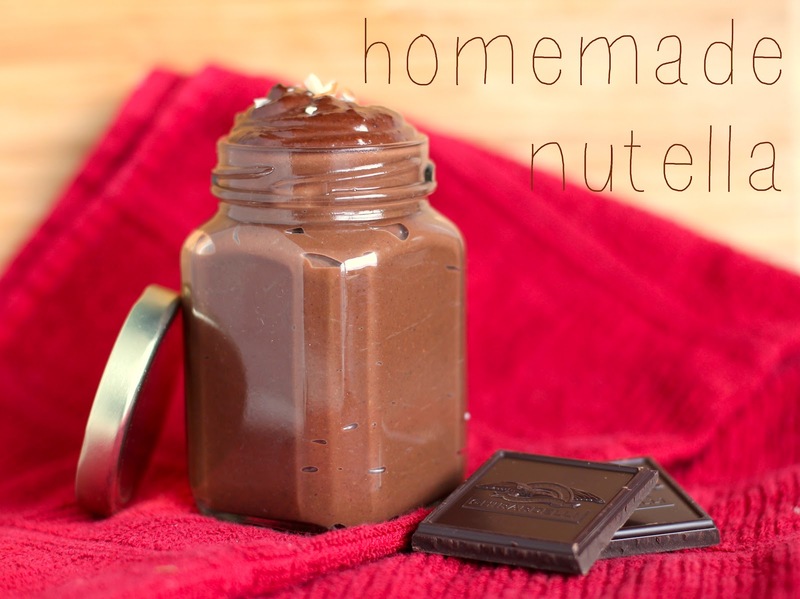 Nutella is my weakness during my pregnancy and with cutting out refined sugar I miss it! Cannot wait to try this!! Will this diy nutella harden in the fridge? I put the commercially-made nutella in the fridge once and it became so hard I had to wait for it to "melt" before spreading it on my bread. 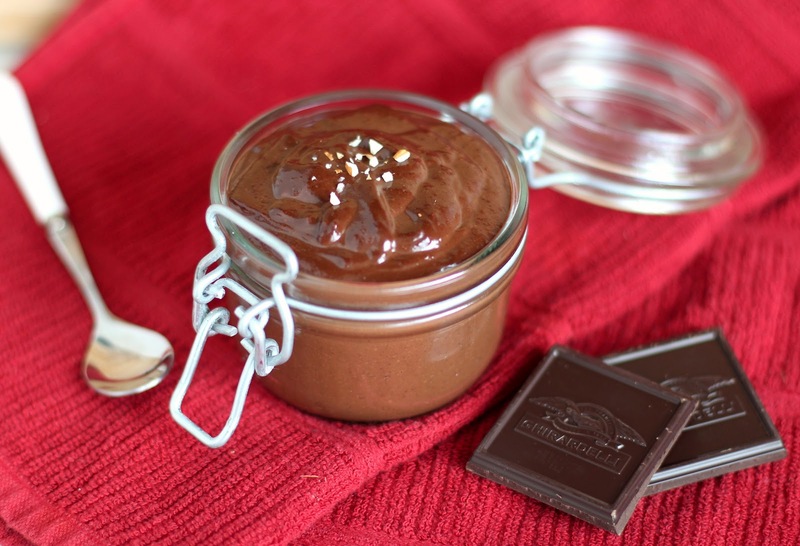 How long can this diy nutella last if I leave it at room temperature? Thanks! This Nutella doesn't harden too much in the fridge. It is slightly firmer than at room temp, similar to peanut butter, but it is still spreadable. I'm not sure how long it will last at room temp because the almond milk is supposed to be refrigerated after opening, but I'm pretty sure it will be fine for couple days. 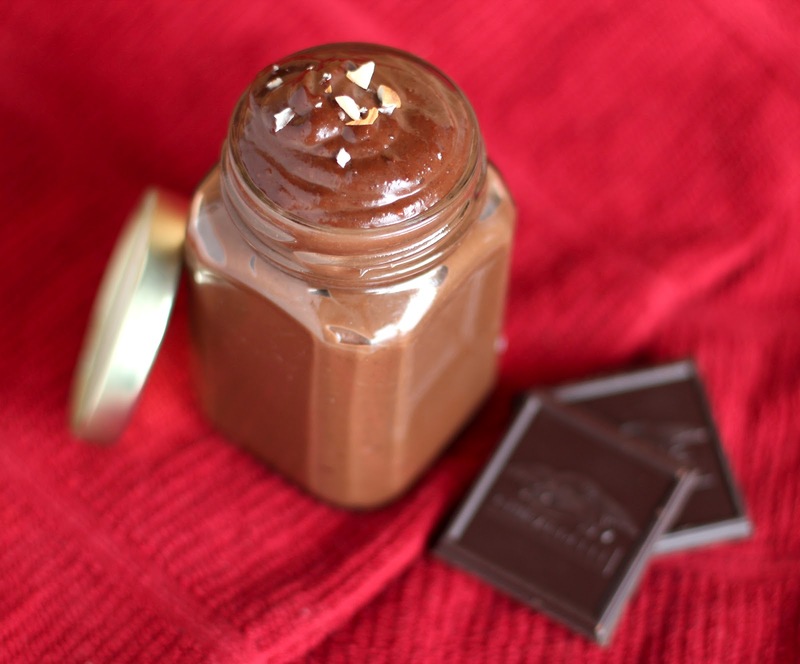 Because the recipe makes a lot, you can keep one jar out at room temp at a time to be safe. Just looking at these pictures is already bringing out the chocolate monster in me... time to go make a batch asap! I love your healthy take on the original stuff. It's hard to resist eating multiple spoonfuls! This is great! Looks so delicious! I see you use both stevia AND another sweetener in this recipie. Is it possible to substitute and use only stevia? not just for this recipie, but for all of yours? anyways, I'm almost scared to make this. THIS LOOKS TOO GOOD. In this recipe, stevia provides about half of the sweetness and the erythritol helps thicken the spread and create a silky smooth texture. I wouldn't recommend using only stevia as it may have an aftertaste and the mixture will be too liquidy. As for my other recipes, it really depends. For baked goods I would recommend keeping the measurements the same, but for other recipes such as overnight oats and cookie doughs (or recipes with added flavorings/nut butters), I'm pretty sure stevia can replace the other sweeteners without the aftertaste (just add some more flour/oats/etc to thicken up what the sweetener WOULD have thickened up). I also need a suggestion to replace the powdered zsweet. I can find the brand but not the pwdered, only granulated :( was trying to make it today but i cant unless there is a suitible subsitute.